Regarding the installation of surge arrester, I tried to find some documents or standards but as they are not free my attempt was without results. I am not specialist for this topic. The question is that is the cable too long for the surge arrester? and can make the voltage over than the tolerance of the device? and how can I find it that the installation of device is under the standard conditions. See if the info below can help. 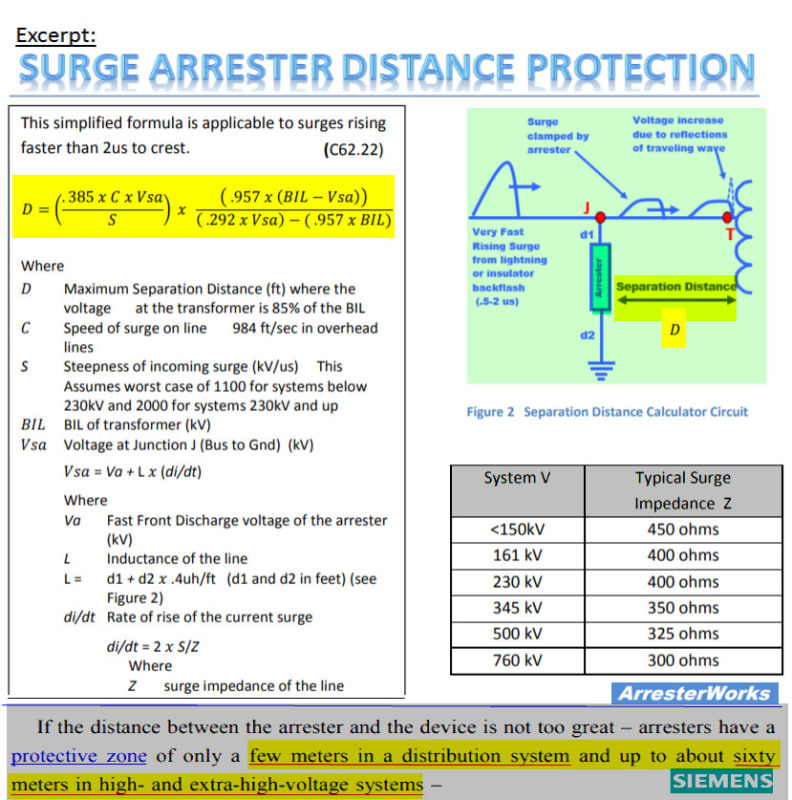 cuky's info addresses the distance from the arrester to the equipment. 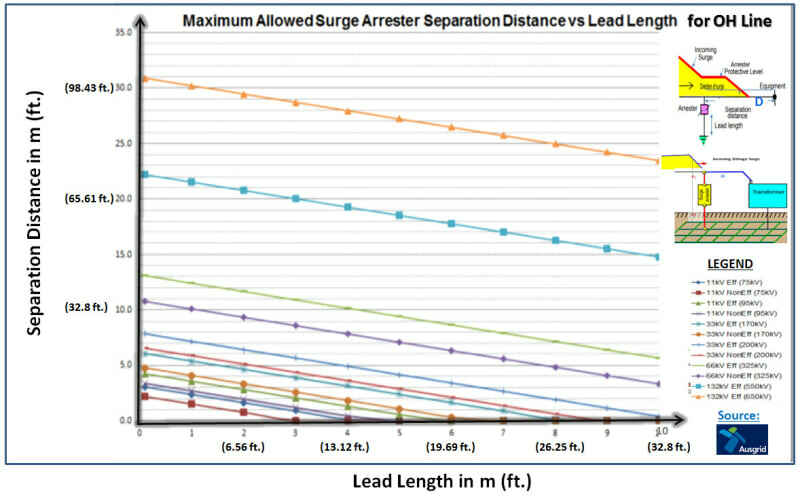 The lead length of the ground wire also has an effect. See Seimens Surge Arresters Application and Selection http://ewh.ieee.org/r3/mississippi/pes/Tech.%20pre... page 37. Hi Jghrist, the info provided include the effect of the lead length (d1 & d2). Thanks for the reply. 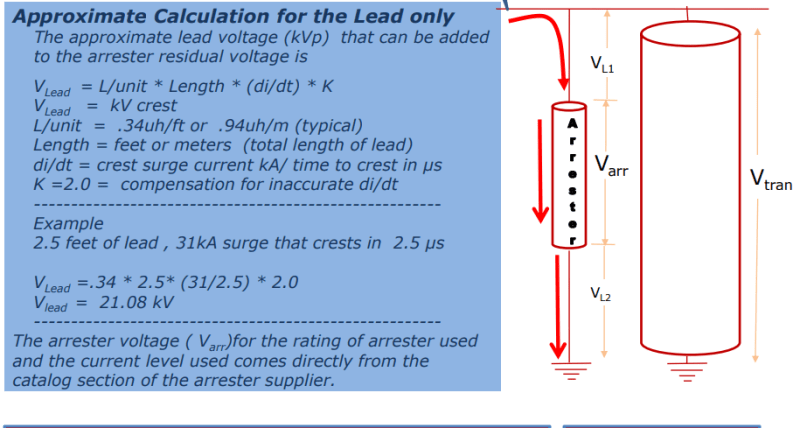 I think what I need is lead voltage calculation for surge arrester. The last graphic is incorrect, since it fails to include the voltage drop across D (from Cuky's chart) for either the phase or ground sides. I was taught that lead length was the total path from arrester to protected insulation on both sides. Thanks for all replies, but I still do not have the idea about that. I tried to find out the length of the cable by a formula but I am still confused!! @stevenal Sorry but your answer is not clear for me! I'll try again. There is a voltage difference from the node where the arrester lead connects to the line, to the node where the transformer connects. This is distance D in Cuky's diagram. There is also a voltage difference between the two ground points, since separate grounds are shown for each. As to my last point, just measure from the top of the arrester along the wire to the transformer bushing, then add the distance from the bottom of the arrester to the grounded transformer tank. This is the distance to be minimized. See if the graph below can help to determine the safe max. separation distance between the arrester and the transformer.